A retirement crisis is looming. In 2008, as the 401(k) fallout rippled across the country, horrified holders watched 25 percent of their funds evaporate overnight. Average 401(k) balances for those approaching retirement are too small to generate more than $4,000 in annual retirement income, and experts predict that nearly half of middle-class workers will be poor or near poor in retirement. But long before the recession, signs were mounting that few people would ever be able to accumulate enough wealth on their own to ensure financial security later in life. This hasn’t always been the case. Each generation of workers since the nineteenth century has had more retirement security than the previous generation. That is, until 1981, when shaky 401(k) plans began replacing traditional pensions. For the last thirty years, we’ve been advised that the best way to build one’s nest egg is to heavily invest in 401(k)-type programs, even though such plans were originally designed to be a supplement to rather than the basis for retirement. This financial experiment, promoted by neoliberals and aggressively peddled by Wall Street, has now come full circle, with tens of millions of Americans discovering that they would have been better off under traditional pension plans long since replaced. As James W. Russell explains, this do-it-yourself retirement system—in which individuals with modest incomes are expected to invest large sums of capital in order to reap the same rewards as high-end money managers—isn’t working. Social Insecurity tells the story of a massive and international retirement robbery—a substantial transfer of wealth from everyday workers to Wall Street financiers via tremendously costly hidden fees. Russell traces what amounts to a perfect swindle, from its ideological origins at Milton Friedman’s infamous Chicago School to its implementation in Chile under Pinochet’s dictatorship and its adoption in America through Reaganomics. Enraging yet hopeful, Russell offers concrete ideas on how individuals and society can arrest this downward spiral. —Nancy J. Altman, co-founder, Social Security Works! On my sixty-fifth birthday, instead of looking forward to retirement, I found myself addressing an overflow crowd of a hundred forty people at a university. I had, with a number of other people, organized a group called the Connecticut Committee for Equity in Retirement. We were speaking at forums for state employees throughout the state about the crisis in our 401(k)-like retirement plan. The crisis was that there would not be enough money for any of us to retire without taking severe plunges in our standards of living. We knew that because the previous spring our employer, the State of Connecticut, was having severe budgetary problems and had offered an incentive for high-seniority employees at the top of their pay scales (such as me) to retire. The state assumed it could save money if we retired. We would be replaced by new, lower-salary employees--or not replaced at all. I say that we were in a 401(k)-like plan because technically we were in a 401(a) plan. Both are named after provisions of the Internal Revenue Service code that deal with a common approach to retirement: build up individual stock market investment accounts to finance retirement income. This approach differs radically from that of traditional pensions and Social Security, as we will see. The only difference between a 401(k) plan and the 401(a) we had is that our employer was in the public rather than private sector. There are a number of other 401(k)-like employer-sponsored plans such as 403(b)s and 457s. The 401(k) plans are simply more recognized because more people have them. Individual Retirement Accounts, though not employer sponsored, follow the same approach of attempting to build up income for retirement through stock market investing. State employees in Connecticut, as well as most other states, are divided between a minority group (mostly working for state colleges and universities) who have the 401(k)-like plans and the majority who still have traditional pensions. The state’s early retirement plan turned out to be a test between the two different approaches. One could logically assume that if the retirement approaches were equally beneficial, there would be roughly equal proportions of employees from the two different plans who would accept the early retirement offer. The results, though, were astounding. More than 40 percent of eligible state employees in the traditional pension accepted the offer, versus only 1 percent in the 401(a) plan. Part of the reason, but only a small part, was that more members of the traditional pension plan accepted the early retirement offer because it was very generous to them. It gave them three extra years of credit, which would mean approximately 5 percent to 6 percent more income for the rest of their lives, amounting in some cases to over $100,000. Members of the other plan were offered a payment of only $6,000 to be spread over three years-- what we bitterly referred to as a tinfoil handshake. By far the largest reason, though, why members of our 401(a) plan did not accept the early retirement offer was because we could not afford to retire based on the inadequate values of our stock market portfolios. So here I stood in front of a hundred forty faculty members and administrators at the University of Connecticut on my sixty-fifth birthday. According to my retirement plan, sixty-five is the usual retirement age. But I had nowhere near the amount of money that I would need to continue to live in retirement more or less the way I live now. The experts tell us that we should have between 70 percent and 100 percent of our final salaries as income during retirement. By my calculation, I had somewhere around 45 percent to 50 percent by combining my 401(a) plan and Social Security projected incomes. Some might think that it had been my fault as well as the faults of all the others who came up or would come up short at retirement time. Maybe I didn’t save enough money. We are constantly urged to put away more money from our take-home paychecks. I am writing these lines, in fact, during National Save for Retirement Week, an occasion promoted by the financial services industry. I believe in saving. I have had a savings account ever since I had a paper route in Muskogee, Oklahoma, which was my first real job when I was twelve years old. Immediately, I set up a savings account. I don’t think there’s ever been a time since then that I’ve not held some savings, however small. Even in the worst of times when I’ve been unemployed, I’ve still managed to keep some savings as a reserve. That just happens to be the way I live my life. In a certain way, this message to save for retirement resonated with me and I did put away money. For a number of years after I paid off my house, I put a sum equivalent to the former mortgage payment into my retirement account. That was in addition to what was normally deducted from my paycheck. Most people I know did not do this. I am not pointing a finger at them, nor am I trying to win a merit badge for my savings habit. I understand why they did not do this. I did it because I have always tried to live a frugal life and believe in the virtue of saving. Many people think I am a cheapskate as a result. At the same time, I understand that it’s very difficult for people to save beyond normal savings for retirement, especially if they are still making house mortgage payments. Until the Great Recession in 2008, the price of houses was only going up. People were paying higher and higher percentages of their incomes for their homes. People with children have considerable additional expenses. When children become college age, college must be paid for. College education has become increasingly expensive. I say that as someone who has made a living from teaching in college. When I began teaching, the cost of public higher education was very affordable, but no longer is. For the 2012¬±2013 academic year, average tuition and fees at public four-year colleges and universities were 3.57 times what they were for the 1982¬±1983 year. For the same period, average per capital income was only 1.37 times higher. All this together--how much you have to pay for a house, how much you have to pay for college, how much you have to pay for normal living expenses--makes it very difficult to save money for retirement. Despite all those odds, I was able to save some money. So my inability to retire cannot be blamed on the lack of a savings ethic. Maybe I did not invest wisely. I’m not an expert investor, nor do I want to be. I do not wish to spend my days worrying about whether my investments are going up or down. There are other things I want to do with my time. Some people enjoy following the stock market and find that interesting and exciting. They can live their lives that way. Most people, though, are probably more like me and have neither the knowledge nor the interest to become expert investors. Nevertheless, I did not invest in a totally foolish way. I diversified my investments. As a result, when the stock market crashed in 2008, I lost about 25 percent of what I had accumulated. Those of us who have 401(k)-type retirement accounts live the myth of Sisyphus: just when we think we’re really doing well, just when we think that our money is building up at a very nice rate, it falls back down again and we have to begin not exactly over again. But we have to build it up again. You might console yourself by thinking that eventually it will come back. There’s no reason to worry every time the money falls back. But--and this is an important problem--rebuilding takes added time that means it will take that much longer to achieve enough money to be able to retire. The real question is whether anyone with ordinary incomes and working lives can ever acquire enough money to retire adequately with these accounts. After a lot of study, I and many others have concluded that the answer is no despite what a financial services industry that profits handsomely from this approach to retirement financing is constantly telling us. But, if you had told me several years ago that on my sixty-fifth birthday I would be standing in front of a crowd trying to urge people to do something about our common retirement problem, I would’ve thought that was crazy. Not, however, because I didn’t have a history of being in front of a crowd trying to urge them to do something. I have a past that goes back to the civil rights movement in Oklahoma. I took part in lunch-counter sit-ins. I organized a protest that led to the desegregation of a school system. Since the 1960s, I have believed that when people see injustices, they should not just adapt to them or accept them. They should try to overcome them, and not just for themselves, but as part of a common struggle with people who have the same problem. We are in bad situations together and get out of them together. I first looked at my retirement prospects in the mid-1990s when the stock market was growing very rapidly. I was not convinced that the bull market would last forever. What goes up must come down. When I calculated the benefit differences between my 401(a) plan and the traditional pension plan that other state workers had, I realized that the problem was far deeper than the unpredictability of stock market investments. I was shocked to find out that even with a bull market, I would receive less than half of what people in the pension plan would receive, and my employee contributions were more than double theirs. I began to discuss this revelation with coworkers. But either most didn’t believe me or the subject was so complicated that they didn’t want to put energy into trying to understand it. Their eyes would glaze over. They’d glance at their watches. Also, because what I was saying was so contrary to what they had been led to believe, many probably thought I had gone wacko. Their reactions were not unusual. They reflected a larger trend in which people do not take an interest in retirement and don’t know much about it. They don’t pay attention, partly because for most retirement is a long way off. People do not retire every day. When they start working, they are like young people who think they are immortal. The idea of retirement is remote. When these employees look at their incomes, they think only of take-home pay, not retirement. Retirement is also a very complicated subject. Its financing is complicated. There are different approaches to it, and within those different approaches, there are more variations. Quite often, especially in the case of 401(k)s, the companies present particularly complicated information. In my own plan, we receive a large document filled with financial information. The problem is that most people don’t understand what that information is. Economics researcher Robert Hiltonsmith set out to uncover the fees that he was paying for his 401(k) plan. Instead, he found that they were hidden, embedded within other figures on his statement. Most have no understanding of their 401(k) statements beyond whether the balances are going up or down. Because the information is so complicated, many people simply don’t want to think about it. Combining the incomprehensibility of the information with the fact that retirement is not an immediate problem produces a recipe for avoidance. Workers only begin to pay attention when they are about to retire and find that what they had assumed was not the case, that their future will be one in which they have far less income than they had thought. Many people believe that they have much more money than they do because they see the size of the 401(k) or similar plans continuing to grow in normal market times. They have more money in them than they have in their checking accounts or in their savings accounts, if they have savings accounts. They assume that they must have a lot of money. The problem is that there’s a difference between the amount of the money in the account and how far it will go in retirement. Most people who have 401(k)s do not really understand what will happen when they actually retire. Their attention is fixed on the accumulation of funds that go up and up, except when stock market dips and crashes send them down. But once they retire, money no longer goes into the 401(k), but has to come out in order to support retirement. Most people have not thought about that and do not understand how that money is used in retirement or the various options involved in using it. Many are averse to planning the future and live in the present. The future--in this case, retirement--is something so abstract that people simply do not pay attention to it. People who do think about retirement tend to trust experts and financial consultants. Financial consultancy is an occupation that has grown with the advent of retirement plans in which individuals must bear all the risk of investing. Most financial consultants have a monetary interest in getting people involved in particular retirement plans. They might present the information in such a way as to steer people into products that they sell. All these reasons make it that much easier for the financial services industry to swindle employees. It is the perfect swindle because retirement income can be robbed, stolen, diverted, or taken without affecting take-home income. Because of that, people don’t realize that their future money is being systematically taken from them. In this case, the swindler is a Wall Street¬±aligned financial services industry that has expanded enormously with the shift to 401(k)-like market accounts. Since 1970, it has tripled its share of gross domestic product and the proportion of all corporate profits from 19.1 percent to 27.1 percent. Administration fees and commissions from managing retirement savings have swelled its revenue and profits. CEO bonuses are the most outrageous tip of the iceberg. By the time I was addressing that crowd at a university, it was clear that the only solution to our problem would be a reform allowing us to transfer from what we judged to be a failing 401(a) retirement plan to the state’s traditional pension plan, which would enable us to retire without taking a plunge in our standard of living. What we were experiencing was a microcosm of what the whole country had been experiencing since the 1980s, when 401(k) and similar plans began to significantly replace traditional pensions. In 1981, 59 percent of private sector employees who had retirement plans had traditional defined benefit pension plans. That shrank dramatically to 19 percent in 2010, with 81 percent now having 401(k)-like plans. According to a recent study of 2.2 million large-company employees who had these types of plans, 85 percent will not “have sufficient resources to meet their needs if they retire at age 65.” It was also a microcosm of international shifts going back to 1981, when a Chilean military dictatorship replaced the country’s traditional national pension system with a stock market investment scheme similar to the one in Connecticut. The 2008 stock market crash shook my coworkers out of their retirement complacency and prompted the formation of our organization. It also shook people throughout the country with similarly deficient retirement funds, producing a number of parallel organizing attempts to resolve the growing retirement crisis. And there have been reform efforts in other countries, including Chile, that have been victims of the same retirement swindle.
? 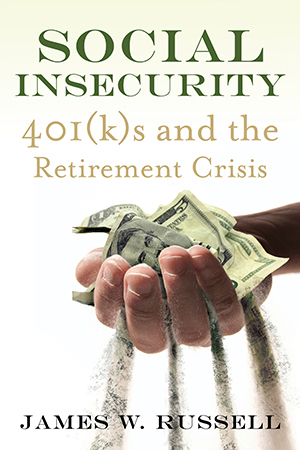 The 401(k) plans produce higher rates of return than traditional pensions or Social Security. ? The 401(k) plans are cheaper for employers and employees than traditional pensions. ? Social Security is going broke and therefore needs to be privatized or reduce its benefits. ? Unfunded liabilities of overly generous public employee pensions will require taxpayer bailouts. ? There is no fiscally sustainable alternative to 401(k)s. ? Only when individuals do not save enough do 401(k)s fail to provide adequate retirement income. None are true. Traditional pensions and Social Security produce higher returns at lower cost than 401(k)s. In fact, Social Security--the backbone of retirement security in this country--is the federal government’s most successful and popular program. It provides an alternative lower-cost public-option retirement plan that performs better than private plans. For thirty years, to undermine public support for the program, conservative think tanks have disseminated false information that Social Security is financially unstable and won’t be there for people when they retire, all in an effort to plant doubts in the minds of the public and make them more receptive to reforms that would privatize or reduce the program. Publicity campaigns that plant alarmist stories in the media about the unfunded liabilities of some public employee pension plans are scare tactics intended to drive wedges of resentment between the beneficiaries of these programs that actually do produce retirement security and taxpayers. Their goal is to have public employee pension plans converted to 401(k)s. As we will see, unfunded liabilities do not by themselves necessarily pose any danger to the fiscal sustainability of pension systems. It is a red herring comparable to saying that the mortgage on your house is an unfunded liability. As long as payments are properly paid, pension funds deliver their benefits in the same way that houses are paid off if mortgage payments are properly paid. The media now acknowledge that boomers are facing a retirement crisis with their 401(k)s. But they argue that it is a crisis of people’s own making since they foolishly failed to save enough. The problem with that morality tale is that no one with ordinary expenses can save enough in these plans to have retirement incomes that will maintain his or her preretirement standard of living. To accuse a whole generation of participants of being improvident is to blame the victims of a gigantic swindle that forced them into plans that were loaded against them. They unknowingly never had a chance, despite all the financial services industry hype that it was a trustworthy custodian guiding their portfolios toward secure retirements gilded with opportunities to travel and other luxuries as rewards for their careers of hard work. The manufactured myths that bolstered the swindle shifted over time. In the beginning was the promise of more generous retirement incomes than those from traditional pensions. That worked for about twenty years until it became patently obvious that the incomes would in fact be significantly less. Then the argument shifted: traditional pensions were too expensive for employers and thus not sustainable. Participants now had to provide for themselves with supplementary savings. Workers had a moral obligation to save. If they did not, they would pay for their improvidence with poverty in their senior years. The myth that continues to be repeated in the blame-the-victim narrative is that the system can work well so long as participants do their parts and save, save, save. But, as we will see, participants would have to live as paupers in order to save enough to generate the portfolios necessary in these schemes to finance comfortable retirements. The manufactured myth campaign has been extraordinarily successful in convincing many people to accept or at least not question changes that were not in their interest. It has created a frame of reference of assumptions about retirement plans, a complicated subject to begin with, that are as commonly held as they are false. The success of the campaign is such that alternative views have nearly been extinguished from media accounts. Large parts of the public have been conditioned to accept the best option for the financial services industry as the only possible plan available for them. Whatever someone’s personal retirement situation is, he or she needs to see through the widely held myths. That requires starting at the beginning: how the different systems and approaches to retirement financing work. We will see that through the 1970s, there was substantial progress in achieving a three-legged stool of retirement security with Social Security, a traditional pension, and personal savings. Then the great U-turn in retirement security began in the early 1980s as shaky 401(k) do-it-yourself investment schemes progressively replaced guaranteed pensions. Employers unloaded responsibility for maintaining solvent retirement plans, including investment risks, onto their employees, often reducing or abandoning contributions as well. How and why that happened is an international tale woven with conservative ideologues, the financial services industry, military dictators, World Bank leaders, privatizations of national retirement systems, and compliant politician enablers. The result was a massive raid on the collective retirement savings of working people to swell the profits of the financial services industry--the origin of the retirement crisis. I wrote this book not just as a criticism of what has happened, a kind of wringing of hands. I wrote it also to show that there are grounds for hope in a small but growing international movement to resist and reject these schemes. The movement counts small-scale victories in individual workplaces to replace failing 401(k) type plans with secure pensions, to teachers that have won back pension plans after having had 401(k)s imposed on them, and to countries that have reversed privatization of their national retirement systems. This book will provoke your thinking about your personal retirement situation and national reforms to reverse the damages.